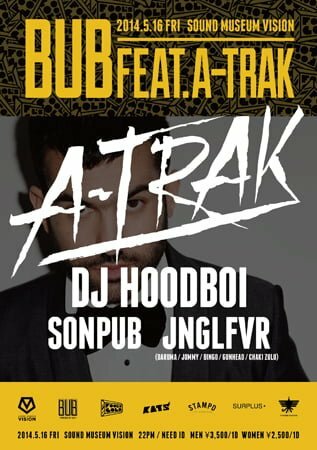 A-Trak the first DJ to win five world championships with his “scratching” skills. Currently a DJ who headlines all the major festivals around the world and this time he headlines the brand new party at VISION “BUB”. A long side A-TRAK who just released a long awaited album from DUCK SAUCE, he is joined by resident DJ, SONPUB and MC WISE, and the new movement in Tokyo’s party scene JNGLFVR. All tickets will be sold at the door on the night. No advanced tickets.